I didn’t have the luxury of growing up in a food driven family. My mom wasn’t the domestic type. I specifically remember one meal she made that left little to be desire. She pulled out a delicious smelling, but not homemade, loaf of garlic bread from the oven. Hungry and eager to dig in, we quickly noticed that she hadn’t taken the plastic wrap off, creating an inedible layer. I cannot remember if we threw the loaf in the trash compactor, or if we cut it the long way and ate the buttery, garlicky middle—something tells me the latter happened—but I think it highlights my mom’s cooking prowess. Eating out and takeout was the Pulkkinen-Harvey way. Sorry if you read this, mom: you were great at everything else. Except driving…I digress, I digress! I got a real dosage of home cooking when I dated this kid named Matt Giglio in high school. Minus the large family, they were the stereotypical, loveable, loud Italians. And there was always food on the table. How he and his sister stayed so skinny, I will never know. Despite my true Haitian heritage, and my very English-German last name, I like to think that if kids are in my future (sweet lord I hope they aren’t!) that I would be of the Italian mom variety. Home cooked meals on the table five nights out of the week, whipped together with love and adoration…and of course a little bit of brassy attitude. The other two nights, if you were curious, would be reserved for a nice restaurant meal and the other would be for leftovers. Yeah, I’ve put a little thought into this. So, a few nights ago I ignored my pungent fish sauce and decided to go the Italian route. Sorry Asian food, you’ll have to wait. 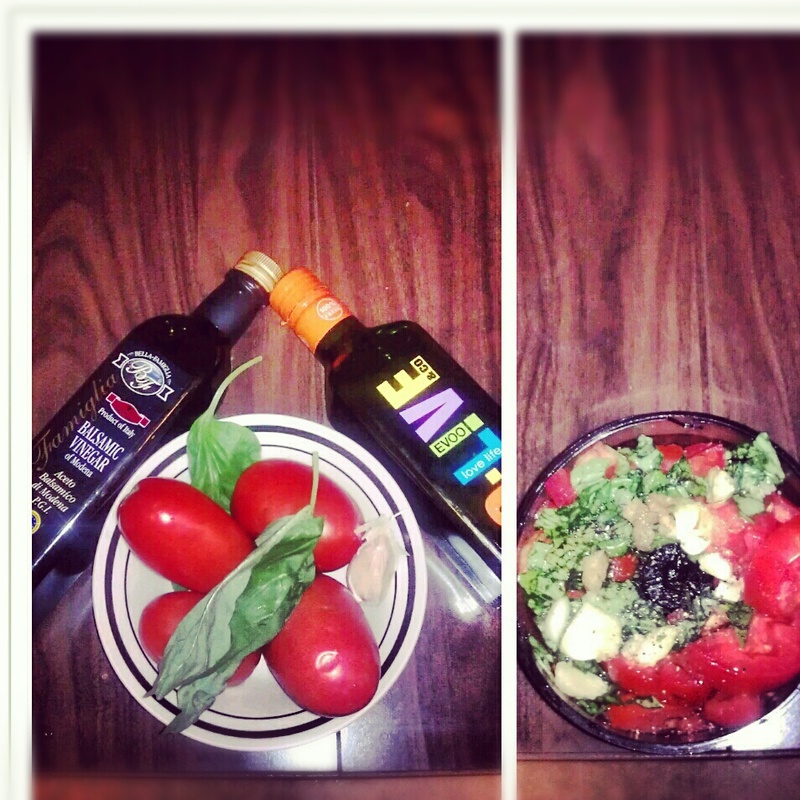 I went with the laziest meal possible, while still being able to keep my culinary muscles flexed. Think of it as an ‘active rest’ day in the kitchen. Folks, you guessed it, I made some pasta. And since I can kind of be an ingredient snob from time to time, I turned my nose up at the jarred, thick, preservative laden sauces that filled the shelves. I find that pasta only feels like a heavy meal when slathered in that red goop, so I ventured out and made my own. Well, I actually slightly modified a Martha Stewart version. Something tells me Stewart isn’t an Italian last name, but her sauce utilizes fresh ingredients, so I figured Mamma Giglio, if she could see me, wouldn’t mind. Bring a large pot of salted water to a boil. Add pasta, and cook until al dente. Drain pasta, and toss it in a serving bowl with the raw sauce. Transfer to 6 shallow bowls, and drizzle with oil. Serve with cheese. 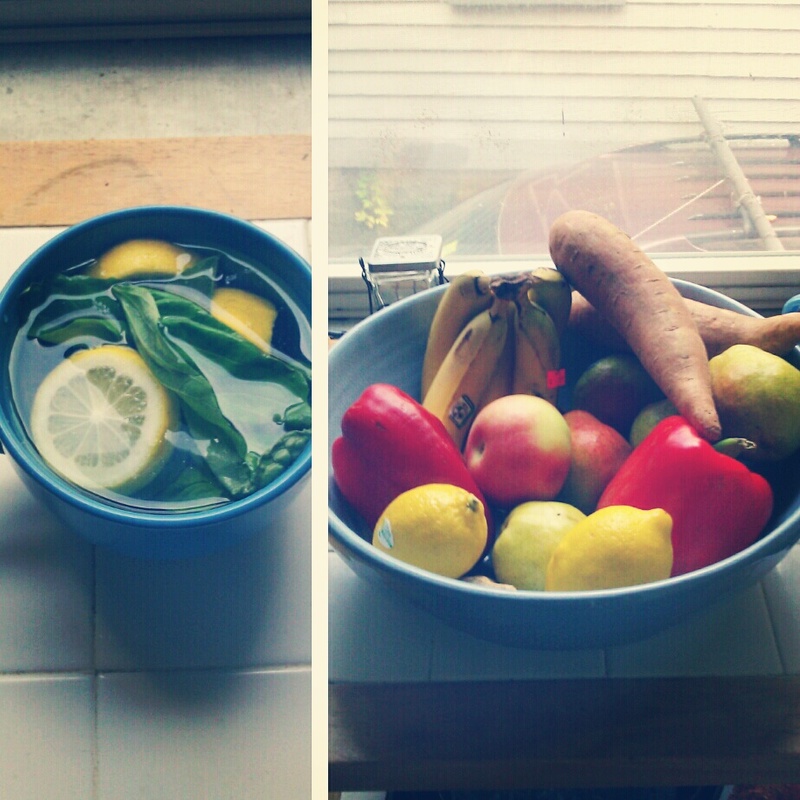 Lemom-basil water and my new fruit bowl. Isn’t it massive and magnificent? !